If you have been reading my blog throughout my Epic journey and even before it, you know that my decision to buy my grail pen didn’t come lightly or impulsively. If you are just now joining me, this moment will seem more climactic if you go back to read the Epic series first. Regardless, I’ll say this: It was worth waiting for. Once I made the decision to buy Sailor’s 21kt gold Naginata (“long sword”) Fude de Mannen nib, choosing the pen’s body was relatively easy. Using the Platinum 3776 Century has taught me that I prefer a somewhat large yet lightweight pen, so I looked for a Sailor body that came closest to the Platinum in dimension and weight: the “1911” (named for the year Sailor was founded) full size. The color and finish, too, were easy choices for me – I’ve always loved the elegance of matte black. The options were relatively limited, as Sailor won’t put its specialty nibs on just any body it makes. 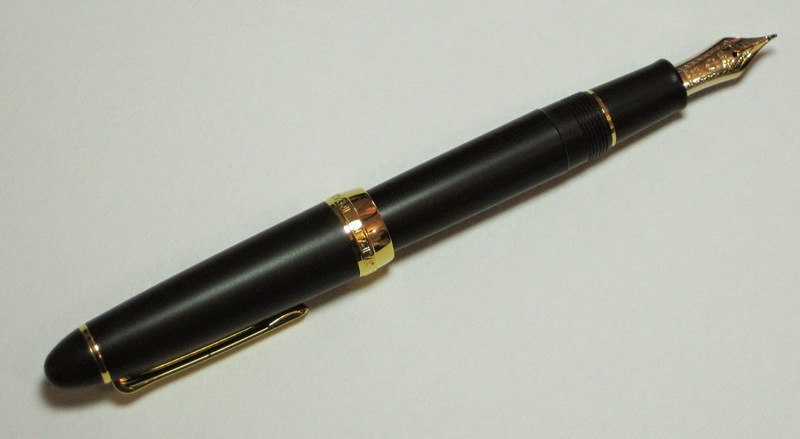 For example, rhodium trim on the matte black body would have been my first choice, but I was told that Sailor would only pair the yellow gold fude nib with the gold-trimmed version. 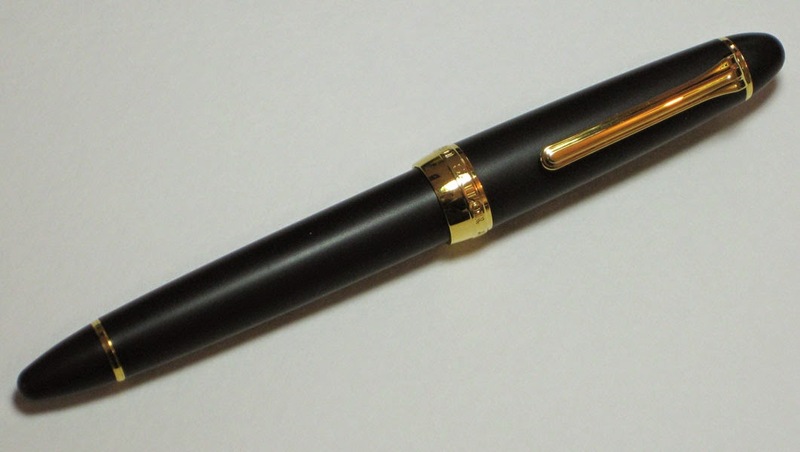 Sailor 1911 full-size pen, matte black with gold trim. With the easy part done, I submitted my order to Nibs.com with a lengthy note to proprietor and nibmeister John Mottishaw, whom I had met back in February at the L.A. Pen Show. I had a hunch from that meeting that he would be responsive to my high-maintenance concerns, which were that the Naginata Fude de Mannen nib I had tried several times at his pen show table felt a bit scratchy to me. The order was placed on March 14. The hard part, then, was waiting: Sailor’s custom-order nibs can take anywhere from a few weeks to several months. But on April 17, before I (hardly) had time to grow impatient, I received an e-mail that my Naginata nib had been received at Nibs.com! And that’s when I got a phone call from John himself. Having read the note I had included with my order, he asked about my concerns, and I reiterated my experience with his sample nib. We talked a while, and John assured me that my nib was indeed very smooth. I took his word for it. And three days later, the pen was in my hands! Other than its material, how is this new nib different from the one that comes on Sailor’s inexpensive models? 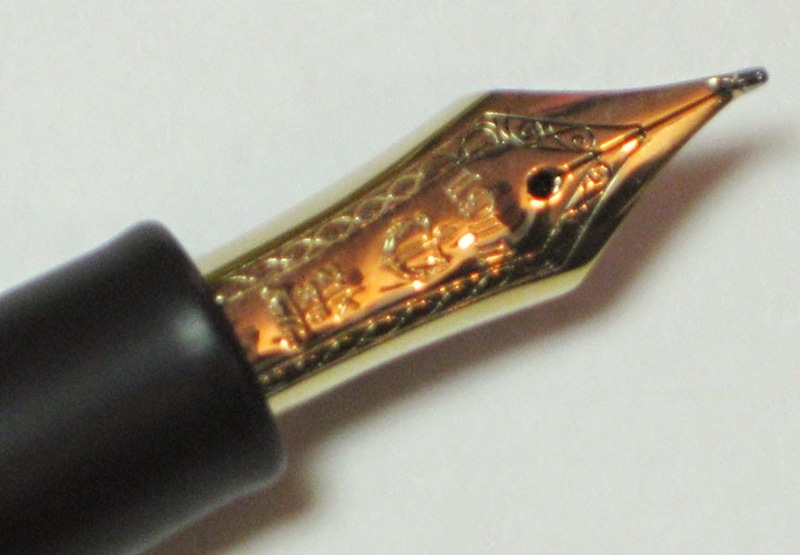 The top has a lot of fancy curlicues and flourishes as befits a 21kt gold nib. But the real difference is seen from the side. While the budget models look bent at a sharp angle, the Naginata Fude de Mannen nib is curved (similar to the very inexpensive Duke 209’s fude nib). In addition, the Naginata has a rounded tip on the top surface compared to both the inexpensive Sailor fude and the Duke, which have flat tip tops. As you know from my previous pen reviews, I generally don’t go on and on about a pen’s body and appearance; the nib is the important part. Still, if a pen isn’t comfortable to use, I’m the first to dump it, so I can’t say I don’t care about a pen’s body. I’ll be as elegant in words as the pen appears: This 1911 has a matte black finish as lovely to hold as it is to behold. The pen’s weight and balance are comfortable. And most important to me: The cap posts perfectly. 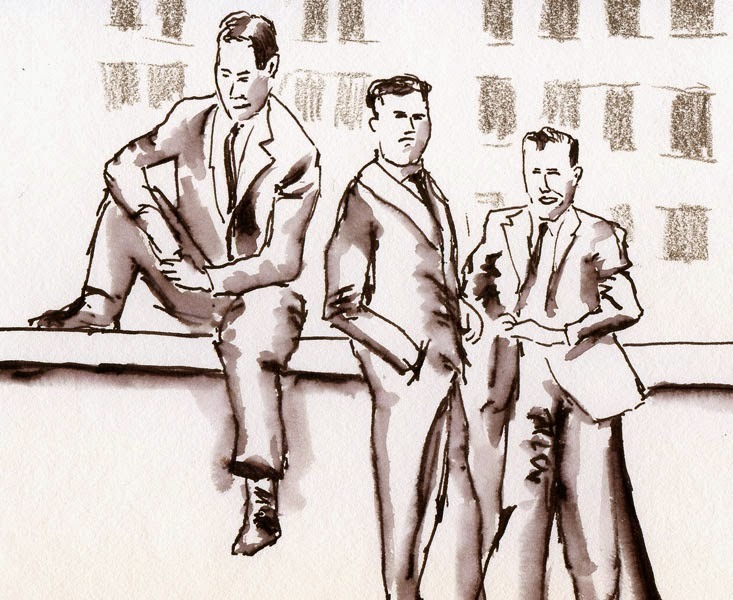 Oh, yes – and how does the nib write? I needn’t have worried. It’s smoother than any pen I’ve used (except perhaps the extremely broad Platinum music nib) and much smoother than my old Sailors. Upside-down, right-side up, and at every angle, it glides easily on any paper. I’m especially excited about how smooth it is when making the finest, reverse-side stroke – fountain pens invariably get scratchier as the nib gets finer. Since it operates exactly the same as the cheap Sailor fude I have known and loved for years, I pick it up and use it intuitively, and it is the same – and yet somehow different. It’s solid and muscular, while my old Sailor feels bony. It’s familiar and at the same time fresh. It’s exactly what I expected – but better. This is a good time to mention the stellar customer service I received from John Mottishaw and his Nibs.com team. Although it turned out that my nib is perfect as is, I am confident from my interactions during my purchase and at the L.A. show that if I hadn’t been happy with it, they would have made it perfect for me. Updated 8/22/15: Now that I’ve used it almost daily for four months, my Sailor Naginata fude has become part of my hand. I’ve discovered over time that it is a very wet-flowing pen – not a proverbial firehose like the Pilot Falcon (FA), but it definitely puts out more ink than the economy-model Sailor fude. After trying water-soluble inks as well as my usual waterproof Platinum Carbon Black ink with the Sailor Naginata, I’ve decided this pen is best used with water-soluble inks – for two reasons. When I use it with waterproof ink, the additional ink flow the nib puts out requires additional drying time before applying watercolor – additional time that I don’t want to have to wait. However, that additional ink flow is exactly what I do prefer when using a water-soluble ink, which I almost always wash with a swipe of the waterbrush to deepen shading in a sketch. The extra ink on the line deepens shading even further. Congratulations! I hope the two of you will be very happy together and look forward to seeing how you use it. Yay!!! Congratulations on the addition to your family! I'll be looking to see your sketches with the new pen...which looks great in the photos and the sketch! Congratulations, hope it will be a long and happy relationship! Oh, forgot to say that my Concord can be a little scratchy on the fine point side. I've tried to adjust it, but it is quite tricky to get it just right, probably because it's now very fine compared to the original Concord. I tried the Concord at Mottishaw's booth in L.A., and it was quite an impressive nib! I loved the line variation, but it was very counter-intuitive because the fine line was at the base of the stroke, while the tip was broader. Really? That's not at all what it's supposed to do. 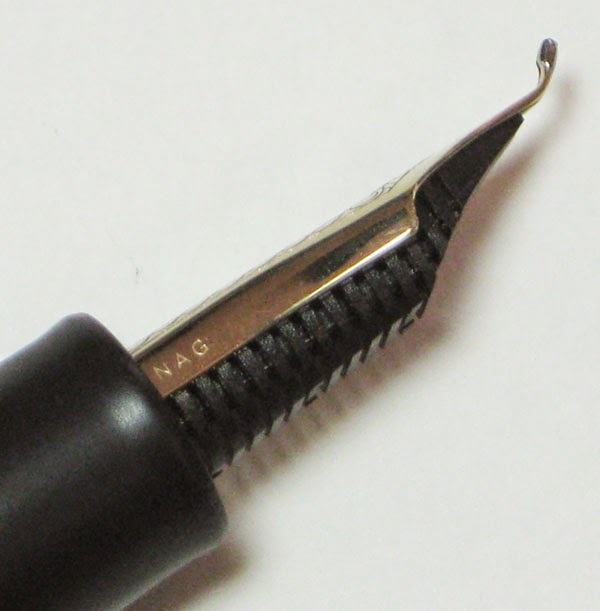 The Concord is essentially a Fude that's bent in the opposite direction, so you normally hold the nib upside-down. The tines are wider at the base and taper down towards the tip. The counter-intuitive part (for me, since I'm used to the fude) was that I had to angle it in the opposite way from what I'm used to. That was my experience, but I only used it for a few minutes. At last! The epic search has been rewarded! Beautiful pen, beautifully written review. Great job, Tina. Hi! Do you still love this pen? I'm thinking of getting one for my art. Yes! 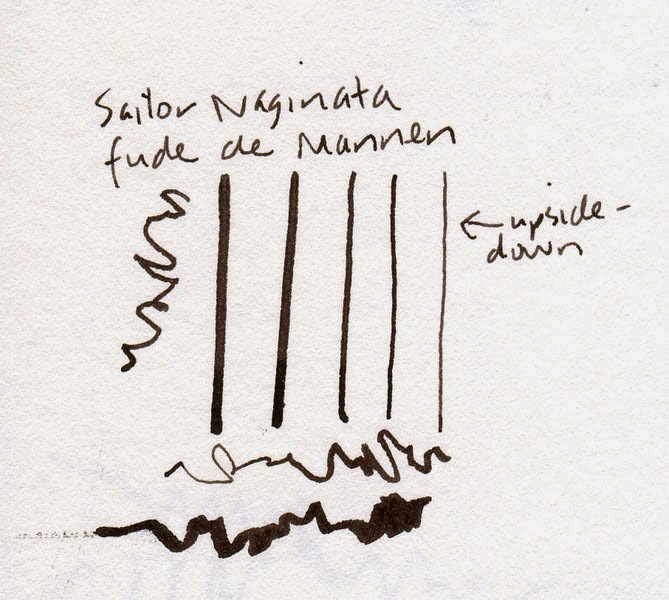 Even though I have many, many fountain pens, the Sailor Naginata fude is the only one I use consistently. I still use it nearly daily! It is very hard to get now & I found one that is exactly yours that this guy only used 2 times & didn't like for him. I have been using the green one & love it. It's expensive though...Is it worth it? 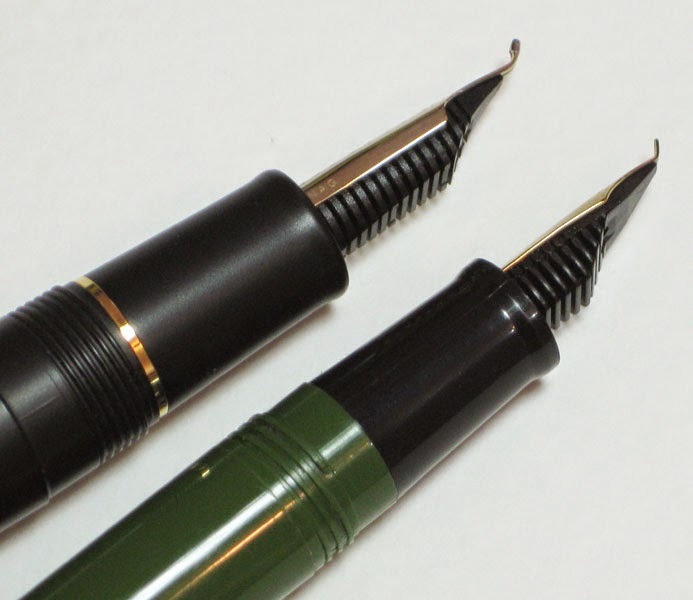 I loved the green one for several years, which is what prompted me to pursue the gold nib version. The gold one which is very different -- so much smoother because it has a curve instead of a bend. It just feels very intuitive and natural in my hand, compared to the green one, which has more of a sharp edge to it. To me, it was worth it because I use it every day. It's hard for me to say whether it will be worth it to you, since I know it's expensive. I guess you'd have to weigh how often you would use it to determine whether it would be worth the cost. Have you decided which is your favorite...the Sailor Fude or the Cross Point? Definitely the fude! The Cross Point is a delicious pen -- so smooth and juicy -- but it just doesn't have the full range of line widths that the fude does. I do love using the Cross Point for writing, though! Thanks for your reply! Because of you I ordered the Cross Point also! I love the Fude but still have to play with it to get used to it.